We have substantial experience in working with public and private sector clients on energy projects varying in both nature and scale. Campbell & Kennedy is a member of the Financial Conduct Authority and is completely impartial regarding funding options. We work with organisations to explore all available models and enable clients to use their own criteria to establish a cost/benefit analysis including a potential returns and finance study. Campbell & Kennedy is a contractor for solar PV on the Renewables & Efficiency Works and Associated Consultancy Services framework for Procurement for Housing. PfH provide support to members through the mini competition process, helping to ensure it meets the needs of your renewables project. This framework is for organisations in England and Wales, however, we are also on the equivalent Renewables framework for Procurement for Housing Scotland. Campbell & Kennedy is on LHC’s Energy Efficiency and Refurbishment framework, giving you confidence that we are specialist, competent contractors (PAS 2030 and MCS or equivalent certified installers). You can also be assured that we install energy saving measures that are compliant with all relevant funding streams (e.g. ECO Funding, Renewable Heat Incentive, Feed in Tariff and Devolved Administration funding). Campbell & Kennedy is on the Low Carbon Electrical Micro-generation framework for solar PV for YPO. This framework is available to all public sector bodies including but not limited to: local authorities, emergency service providers, NHS, educational establishments and housing authorities. To use the framework, customers need to carry out a Call for Competition. YPO are able to provide template documentation and technical and administrative support with this. Campbell & Kennedy is a supplier on ESPO’s Renewable energy solutions (microgeneration) framework. This is a framework for the supply and installation of solar PV systems (primarily focused on systems up to 50kW electricity) and can be used by any public sector organisation in the UK. There are several benefits of this framework. Solar PV installers are MCS and RECC accredited and have been assessed during the procurement process for their financial stability, track record, experience and technical & professional ability. This framework is compliant with UK/EU procurement legislation, ensuring that your organisation procures in line with the law. Campbell & Kennedy is an appointed contract to the Renewables (Solar Photovoltaic) framework with the Coal Authority. The Coal Authority’s Environment team is dedicated to the management of over 70 coal and metal mine water treatment schemes across Britain. The team is looking at ways to convert mining liabilities and waste products into assets, for instance via energy efficiency and generation. This framework will enable Campbell & Kennedy to deliver high quality roof and ground mount solar PV installations to Coal Authority sites throughout the UK. Campbell & Kennedy is a supplier on Fusion21’s Retrofit framework. The framework covers both commercial and domestic properties and includes a range of funding options. ‘Retrofit’ applies to any works to an existing property that improves energy efficiency or reduces its ‘carbon footprint’. In most circumstances, works to improve energy efficiency of existing buildings will be more cost effective in the long term than demolition and new build or increasing ‘green’ generation capacity. The framework is available for either direct call off to the top ranked supplier within your region or by undertaking a mini competition with the suppliers appointed to your region. This framework typically saves members up to 30% on market prices and there is no joining fee or annual charge. Campbell & Kennedy is on Scotland Excel’s Energy Efficiency Contractors framework for solar PV retrofit installations. Currently, all 32 Scottish local authorities are member Councils and c. 50 organisations are associate members. The framework has been set up to satisfy two main workstreams. The first is the Energy Efficiency Standards for Social Housing (EESSH). EESSH sets the mandatory minimum standard for the energy efficiency rating of various property types for social landlord’s properties in Scotland. The second workstream is the Home Energy Efficiency Programme for Scotland:Area Based Scheme (HEEPS:ABS). The HEEPS:ABS is funded by the Scottish Government and administered by Councils within their respective geographical areas. The scheme provides a grant funding mechanism to enable private householders to have certain energy efficiency measures installed. The funding will be subject to conditions set by the Scottish Government and the location of the properties determined at local level by the Council. Following a competitive tendering process, Campbell & Kennedy has been appointed to City Building’s solar PV and solar thermal frameworks. Campbell & Kennedy has been awarded to Central Bedfordshire Council’s solar PV framework following a competitive tendering process. We have been vetted and are approved to design and install solar PV systems for domestic and commercial properties on behalf of the council. Campbell & Kennedy has been appointed to the Energy Efficiency Works framework for Flintshire County Council. The framework has been set up to help eliminate fuel poverty in Wales and deliver a simple and OJEU compliant procurement route for all energy efficiency retrofit schemes. Campbell & Kennedy has been appointed to the solar PV framework for Herefordshire Council. The framework has been set up to deliver a simple and OJEU compliant procurement route for all energy efficiency schemes. Campbell & Kennedy has been appointed to the Investment Works Contractor framework for solar PV for Places for People, providing sustainable homes across England and Wales. Campbell & Kennedy is an approved contractor on the Kent and Medway Sustainable Energy Retrofitting framework. Campbell & Kennedy is an approved contractor on Oldham Council’s solar PV framework. Campbell & Kennedy is an approved contractor on Portsmouth City Council’s solar PV framework. The Framework is available to The Portsmouth Regional Procurement Partnership (PRPP) consisting of Portsmouth City Council, Havant Borough Council, Fareham Borough Council, Gosport Borough Council, The University of Portsmouth and Portsmouth Hospital Trust and NHS Portsmouth – trading as Solent Supplies Team. Campbell & Kennedy is an approved solar PV contractor on the Microgeneration framework for Northumberland County Council. Campbell & Kennedy is an approved contractor on the solar PV retrofit framework for Southend on Sea Borough Council. Campbell & Kennedy is an approved supplier on Procurement for Housing Scotland’s solar PV retrofit framework. The Scottish Procurement Alliance (SPA) was created both by and for organisations that buy products and services for the construction, refurbishment and maintenance of social housing and public buildings throughout Scotland. It is backed by LHC, one of the leading and most respected procurement organisations in the UK. The Welsh Procurement Alliance (WPA) is a new approach for procurement in Wales, created for organisations that buy products and services for the construction, refurbishment and maintenance of social housing and public buildings. It is backed by LHC, one of the leading and most respected public sector procurement organisations in the UK. C&K has a wealth of experience in solar PV installation for social housing, new build and commercial properties. We work with Local Authorities, Housing Associations, Agricultural Organisations, Commercial and Industrial Organisations and our engineers are fully trained to the latest industry standards to ensure a high quality service every time. Systems/software e.g. AutoCAD, PVSol, Teds, PVSyst, electronic communication for test certification etc. 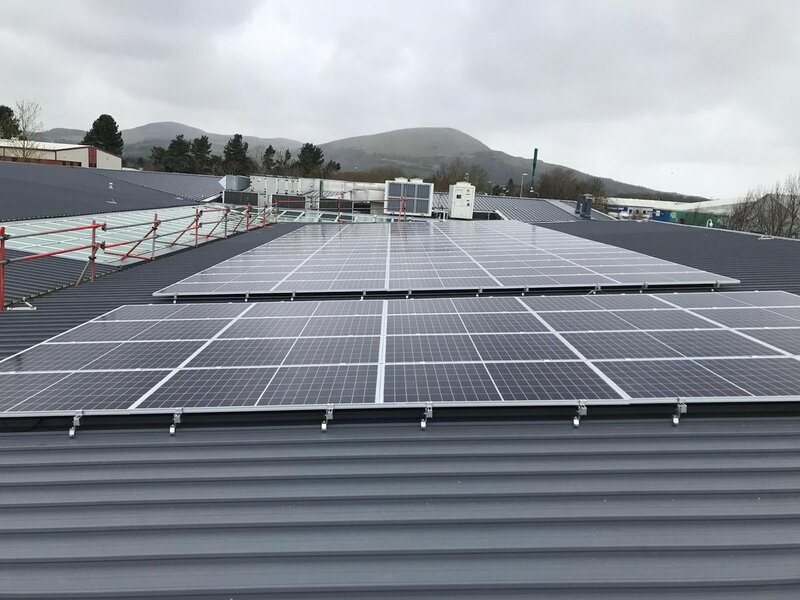 Campbell & Kennedy’s award-winning team has a wealth of experience of installing solar PV to schools across Scotland, having installed to over 50 schools (figure at February 2017) to date. Solar is a fantastic way to inspire and educate the next generation while reducing electricity costs and in turn your building’s carbon footprint. We understand though that not all budgets can stretch to accommodate renewable energy installations, which is why we help by providing advice and access to funding. There are funding options that enable your organisation to have a solar system installed for free, whilst enjoying the benefits of reduced energy bills from day one. Fuel poverty is a major issue for social housing and as energy prices rise, more and more residents’ are being left unable to heat their homes. Installing solar PV will help reduce fuel poverty by allowing residents to generate their own electricity/hot water, which will save them money on their energy bills, while also reducing carbon emissions. C&K has a wealth of experience in working with social housing providers and delivering first class customer service to both tenants and clients. Examples of these projects include: 2200 systems for Babergh & Mid Suffolk Council, 300 installations for Ealing Council and 500 installations for GHA, to name but a few. C&K can also introduce you to the public sector frameworks we are appointed to, allowing you to potentially save time and resource while also ensuring compliance with procurement legislation. Most solar panels we think of are roof mounted but in many cases it is desirable to mount them on the ground. This could be because a roof is not suitable for some reason, or perhaps a better orientation can be achieved from a ground mounted system. Some properties choose to optimise surrounding land area to install a solar PV system. Panels are positioned on a tilt frame and oriented at around 30 degrees. This assures maximum solar energy absorption and output. C&K manage the whole process, from initial feasibility studies, survey, design and finance through to the lifetime maintenance of the system. We will ensure the system is designed to gain maximum return on investment and is installed to the highest quality standard. C&K has a wealth of experience installing solar to public sector buildings throughout the UK, including schools, office buildings, universities and more. Our team delivers quality installations at the best value possible, whilst minimising disruption to our clients’ daily operations. We have a perfect health & safety record so you have peace of mind you are in safe hands. We also help inform current and future generations by delivering educational workshops within schools and provide full training to our clients’ energy teams. PV for free/rent-a-roof options available. Save money on your energy bill and generate income by exporting to the grid. Help meet ambitious Government carbon reduction targets. Good public relations by showing your community a commitment to making a greener environment. Solar PV systems generate renewable electricity/hot water, which reduces costs and energy consumption and helps new build properties to be more sustainable. With solar, you can better meet the required BREEAM rating for building warrants and provide a more attractive property on the market place via a high scoring Energy Performance Certificate (EPC). C&K’s fully qualified team works with architects, developers and main contractors to provide a complete turnkey solution, delivering the works on time and integrating seamlessly into the project. On all projects we deliver on-time and liaise with other contractors to ensure that the works are well coordinated. Some examples of our clients include Bancon Construction, Balfour Beatty, Merchant Homes and City Building, to name but a few. Installing solar panels to new build properties can help achieve a high scoring Energy Performance Certificate (EPC). Solar carports are ground-mounted canopy constructions that stretch out over your car parking spaces. The canopy roof area is slightly tilted – offers a perfect platform for solar panels to be seamlessly mounted, which also adds to the aesthetics of the structure. The tilted roof is not only beneficial for optimising the angle of the solar panels for energy generation, but it also offers natural drainage for rainwater which is then collected by guttering and channelled away. Electricity generated by the carports’ solar panels is immediately available to be used onsite. All solar carports can include guttering, water management, LED motion controlled lighting, CCTV installation, advertising & branding and EV charging points. Here at Campbell & Kennedy, we provide a complete energy storage installation service for a variety of sectors and property types. One of our team will survey your property before providing you with a quotation including full designs and schematics. We will then send one of our qualified and experienced engineers to install your energy storage system. Once complete they will fully test and commission the unit as well as provide you with a full operations and maintenance pack along with final system demonstration. Our sophisticated and smart energy storage ranges stand out above the rest so you won’t be disappointed with performance or aesthetics. Switching to low energy light bulbs is one of the easiest ways to reduce your carbon footprint. We are increasingly seeing LED lighting replace conventional lighting in homes, offices, warehouses and street lighting due to their efficiency and low energy. Our team can help you choose the most efficient bulbs for your property. Contemporary LED bulbs use up to 90% less energy than standard light bulbs and are tested and manufactured to EU standards to ensure that they are safe and efficient, helping to lower the energy required to power them and reducing your carbon footprint. LED lighting can also help with achieving a high scoring Energy Performance Certificate (EPC) – essential for new build properties. LED lasts up to 25 times longer than conventional light sources – guaranteed up to 5 years. We provide an independent, low cost, highly responsive personal EPC service at an unbeatable price. Instead of treating an EPC as just another certificate to be obtained, we see it as part of the vital process of improving the energy efficiency of properties. Campbell & Kennedy provide the standard legal certificate needed, this is accompanied by a recommendation report and placed on the central register, with either an electronically or paper based reports sent out for your records. EPCs tell you how energy efficient a building is and give it a rating from A (very efficient) to G (inefficient). The EPC will also state what the energy-efficiency rating could be if improvements are made, and highlights cost-effective ways to achieve a better rating. All domestic and commercial buildings in the UK available to buy or rent must have an EPC. In the United Kingdom, all domestic and commercial buildings that are available for purchasing or renting have to have an Energy Performance Certificate (EPC). We only install electric vehicle charging equipment that has been through our rigorous testing and due diligence. When it comes to EV charging, reliability is everything – so we only install EV chargers that we’re confident won’t let you down. We offer a range of domestic electric vehicle charging stations. Choosing the correct EV charger for your business can be confusing. Knowing which charging stations, connectors and cable types depends entirely on your needs and the needs of your customers. Speak to us today to find out which EV solution is best for you. Having a charge point at the workplace will become increasingly important as a facility for employees and visitors, while for businesses with an EV fleet it can be an essential operating factor. Campbell & Kennedy is the approved installer of CircoSense3000. CircoSense3000 keeps “learning” constantly and continuously adjusts the look-ahead running times to the actual tapping times. If particular habits are abandoned, CircoSense3000 of course “forgets” them again, too. This means that CircoSense3000 reduces energy consumptions in secondary return hot water systems by preventing the circulation of water at times of no demand, reducing energy costs of heating the hot water and lower carbon emissions. In fact, if CircoSense3000 was installed in just 75% of primary schools across the UK, this would be the equivalent of taking 320,000 cars off the road!